A new and decidedly undesirable alien species has recently arrived in this country. It was sighted both in Guildford and in New Alresford this September. They pose a real threat to honey bees and other pollinators if they become established. 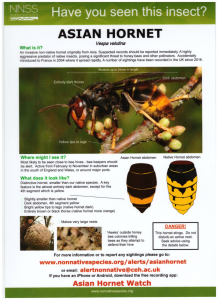 Any sightings should be reported immediately to the Non-Native Species Secretariat, or to BCG if preferred and we will deal with it. The Secretariat has issued a poster on how to recognise this menace and how to report it.